On Sunday, December 8th from 2pm to 7pm, Glass Tears founder Randal S. Doaty will be holding an open house at the Center for the Arts at the Hill School located at 860 Beech Street in Pottstown. Doaty is a local glass artist and poet who will be showcasing his Glass Tears creations and poetry, as well as selling his custom Glass Tears Christmas tree ornaments to visitors. Doaty will be handcrafting special Christmas Tears ornaments with his flame working torch to sell as a fundraising effort. All of the proceeds from the sale of his custom creations will go to benefit the Pottstown Mercury’s Operation Holidays to benefit local families at Christmas. These special ornaments will only be sold at this special Open House event and are not available for sale at the Glass Tears webstore. The Mercury’s stories of families facing difficult challenges during the holiday season inspired Doaty to offer his unique gifts to raise money for this local effort. Randal Doaty is currently the Director of Security at the Hill School. He is also known throughout the community as a real estate business man and former Chief of Police. On Sunday he will put on his artist’s hat and share another side. The Glass Tears concept was born when Doaty noticed a scrap of glass sparkling in the sunlight in a scrap glass bucket at Taylor Backes glass studio in Boyertown. He remembers thinking “glass tear” when he saw glass dropping during a visit to the studio. Weeks later, Doaty commissioned his long-time friend and fellow glass artist Will Dexter to create a similar free standing glass teardrop as a sympathy gift for a good friend. The original glass teardrop Dexter created was beautiful, but it had no voice. Doaty decided to pen the very first poem he had ever written entitled “Glass Tears”. The union of the glass art and the poetry became a winning combination. Others who saw the unique sympathy gift began to order them and the Glass Tears business was born. To date Doaty had written more than 400 Glass Tears poems and has also published his first book of poetry. The original intent of the Glass Tears gift was an expression of sympathy, but today these gifts are used for a wide range of occasions. “Tears are the punctuation marks in life’s most powerful moments” says Doaty. His glass art and poetry are now used to convey messages of courage, hope, faith, joy, sorrow, friendship, thanks and much more. These special keepsakes have been sold around the world and as far away as Australia and Africa. 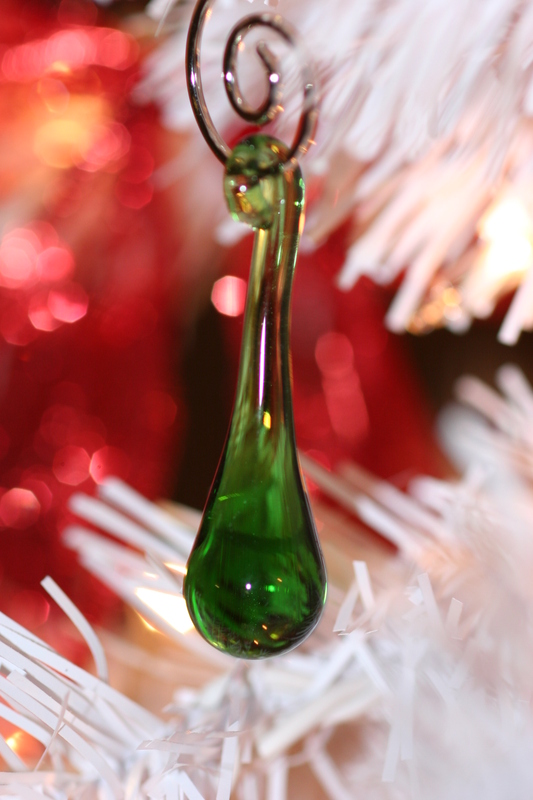 The special Christmas tree ornaments that Doaty will be crafting on Sunday are his special occasion tears represented by their unique colors glass. He has an emerald tear of hope, a blue Christmas teardrop for grief support, a purple tear of courage, a pink breast cancer battle tear, an ivory tear of love or faith, plus several more. He even has a black onyx “Biker’s Tear” that has become popular with motorcycle enthusiasts. The ornaments and decorative hangers will sell for $15 each or two for $25. They will only be sold as fast as he can handcraft them at the event or while his supplies last. This is a great opportunity to help local families who cannot afford a special holiday of their own. Doaty hopes to inspire other local businesses to step in and support the Operation Holiday during these difficult economic times. Pottsgrove Manor’s annual Candlelight Tour once again coincides with Pottstown’s Historic Holiday House Tour. See Evan Brandt’s blog post here for all the details and enticing photos. Great opportunity to see the insides of some of Pottstown’s loveliest historic homes… including that of our founder, John Potts! Shrek the musical at Steel River: Family fun for everyone! It isn’t easy being … GREEN! Bring the whole family to Steel River Playhouse, 245 E. High Street in Pottstown and celebrate the holidays with everyone’s favorite ogre, Shrek! 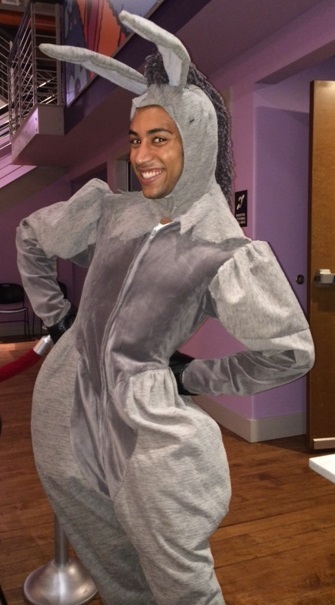 Fun for the “kid” in all of us, Shrek the Musical runs Thursdays through Sundays, December 5th through 22nd. Take advantage of a range of special family events at no extra charge, especially during the Opening Weekend “Five Years on High” celebration in honor of Steel River’s fifth anniversary on High Street! Here’s your Shrek refresher to access your funny bone … In a faraway kingdom turned upside down, things get ugly when an unseemly ogre – not a handsome prince – shows up to rescue a feisty princess. Add a donkey who won’t stop talking, a vertically challenged bad guy with a “short” temper, a cookie with an attitude, and over a dozen other fairy tale misfits, and you’ve got the kind of mess that calls for a real hero. Luckily, there’s one on hand – Shrek! The familiar music will have you tapping your toes, and the heartwarming story will put a smile on everyone’s face. Opening weekend includes complimentary photos with the cast (12/5 through 12/8), free gingerbread treats (12/5) and candy cane treats (12/6 through 12/8), and a complimentary reception sponsored by Lily’s Grill (12/6). You can also join the cast and crew for special talkbacks after the show on Sundays, 12/6 and 12/15. Other special events include free “Family Fun Days” on Sundays, 12/8 and 12/15 from 1:30 to 2:30 pm, immediately prior to the 3:00 pm matinee performances. Designed for ages 6 through Adult, Family Fun activities include comedy/improv and theater games facilitated by Steel River’s expert instructors. Pair this event with tickets to see Shrek the Musical and a FREE talk-back session to chat with the actors after the show. Make it a magical day your family will remember! But WAIT, there’s MORE! On Saturday, December 14th, you can participate OR observe one-day only Stage Combat and Tap Dance workshops with special guest artists James N. Brown (Certified Teacher, SAFD), Adam Kissinger (Actor/Combatant, SAFD Theatre), and Johnnie Hobbs, III (Los Angeles tap dancer, actor, director, and producer). Divided by age groups, the workshops will cover unarmed stage violence as well as tap dance history, technique, and choreography. Sign up by December 5th, and receive $3 off tickets to the first weekend performances of Shrek the Musical. More information is available at www.steelriver.org. And while you’re at Steel River, be sure to check out the new concession and retail area, where you can pre-order your intermission treats for fastest service, including Sly Fox Beer as well as an assortment of wine, sodas, indulgent treats, and healthy snacks. There’s great holiday shopping too, with Silver Shoppe jewelry and authentic gemstones, glass ornaments (including limited edition Shrek themes), and Steel River logo items (wine glasses, cheese trays and more). Shrek the Musical runs Thursdays at 7:30 pm, Fridays and Saturdays at 8:00 pm, and Sundays at 3:00 pm, December 5th through 22nd. Tickets are $15 – $27 and may be purchased online. Steel River Playhouse is located at 245 E. High St., Pottstown, PA 19464. Purchase tickets at www.steelriver.org or by contacting boxoffice@steelriver.org or 610-970-1199. Please note: children under 4 will not be admitted to the theater. Steel River Playhouse is a nonprofit 501(c)(3) charitable education and performance facility that seeks to strengthen community, inspire creative exploration, educate, and entertain, through the presentation of quality performing arts events and education for diverse audiences. Designated as a “gateway” performing arts center, Steel River provides affordable, high quality performances, comprehensive educational offerings, and enriching volunteer opportunities in all aspects of theatre arts. The organization embraces emerging and established artists, and supports community by serving as a magnet destination for economic development and a platform for shared experiences by diverse audiences. Students and volunteers of all ages and backgrounds are encouraged to explore and grow their skills by working side-by-side with professional instructors, performers, directors, and designers. More information is available at www.steelriver.org. A Coventry Christmas Celebration ~ December 7 ~ 1-3pm. Join us for this exciting event filled with lots of fun for the entire family! Enjoy hot soup and hot drinks and get a FREE Christmas tree for your family and FREE stockings for your children. All while supplies last. Feel Free to call the church at 610-343-0480 if you have any questions. 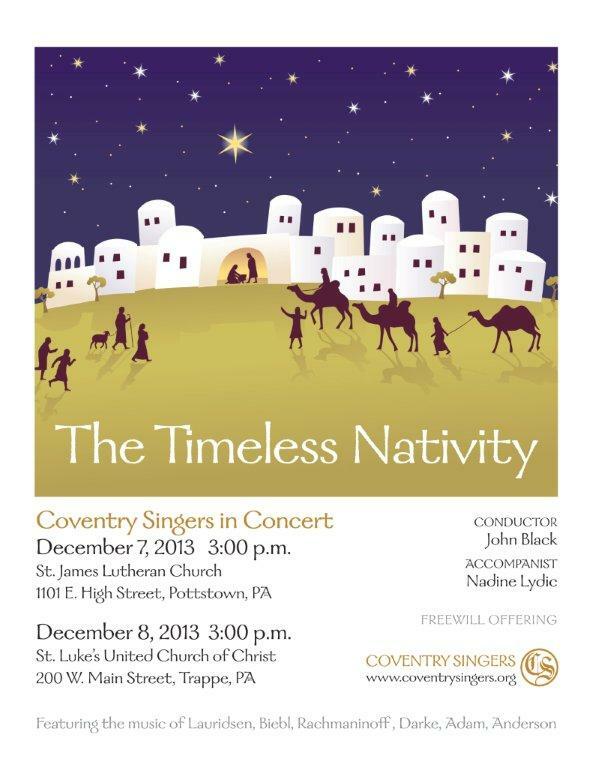 The Coventry Singers present “The Timeless Nativity” this Saturday (Pottstown) and Sunday (Trappe) at 3 pm. These concerts are absolutely wonderful and guaranteed to put you in the mood for the true meaning of the season. See below for details. Drive to 911 South Street in Pottstown, park your car, tune your radio to 99.3 FM and enjoy the light show! It runs from 5-10 pm nightly. Check out their Facebook page here. Well, this is the longest I’ve gone without posting here since starting the blog in April 2010. I ask for your understanding. I’m in the midst of a first-year-teacher sprint. As many of you know, I started teaching English at The Hill School this past September. Well, actually, the training began in August, and I’ve been going non-stop ever since, figuring out how to fit in all the activities in the life of a boarding school teacher: lesson plans, reading papers, grading and comments, seated meals, parents’ weekend, dorm duty, professional development, and, now, assisting with girls’ basketball. Somehow I moved on-campus 5 weeks ago with all this swirling about; I’m not sure how that even happened, but it did! I did manage to squeeze in a few book events for the Legendary Locals of Pottstown. Laura Catalano wrote a wonderful article for The Mercury last week – Thank you to The Mercury and Laura! I also had the chance to attend a ceremony for the MOSAIC Community Garden, which was recognized with a Montgomery County Planning Award. Here’s another nice Mercury article about the garden and the award. I do miss my Pottstown people and being in the midst of Pottstown’s happenings, but I also love being in the classroom, working with young people, talking about stories, teaching writing, and wrestling with ideas and the big questions about life that good literature raises. I have not, however, given up on posting events here and on Facebook! It will likely come in spurts, though, whenever I can briefly switch gears. Hope all is well with you, my dear readers and friends. I’m wishing you a joyous holiday season!